Kamigamo shrine is the oldest shrine in Kyoto. The shrine is known for its Aoi Matsuri (Hollyhock Festival), one of Kyoto’s three big festivals being held every May 15th at 10:30am, a large procession dressed in the style of the Heian court leaves from the Imperial Palace to Shimogamo, and ends the day at Kamigamo shrine. The sanctuaries are said to have been built at the end of the 7th century. These sanctuaries stand on a huge site. 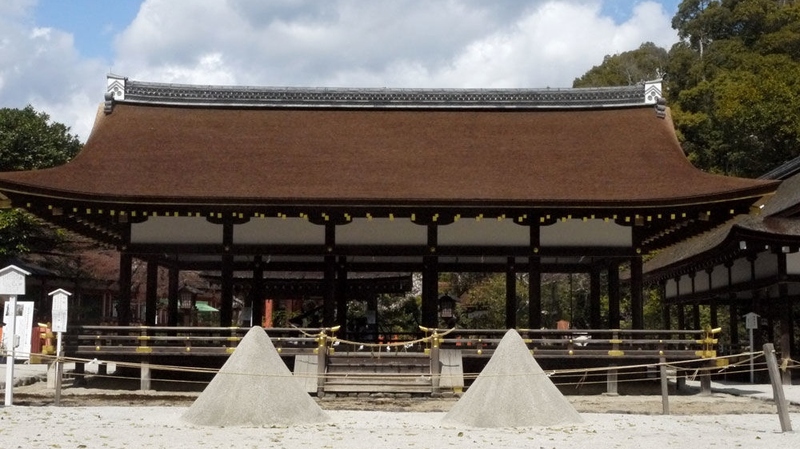 The main shrine and the Gonden (the temporary main shrine where the deity is enshrined while the main shrine was being built) are designated as National Treasures and 34 other buildings of this shrine are designated as Important Cultural Properties. Each one of these structures is also recognized by UNESCO as World Cultural Heritage. The shrine is surrounded by stone walls and white earthen walls. The neighborhood of uniquely shaped houses in which past Shinto priests at this shrine lived has been selected by the national government as an Important Traditional Residential Area. Some of these houses are open to the public. Access : 15-minute walk from Kitayama station on the Karasuma subway line. Bus : Kyoto City Bus No.4 from JR Kyoto Station to Kamigamo-jinjya mae.